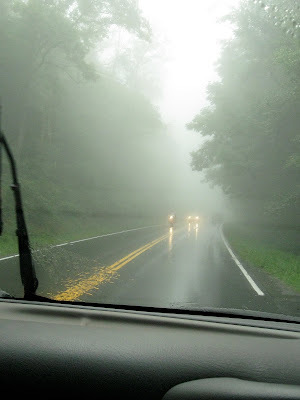 Rain and fog soak Newfound Gap road. 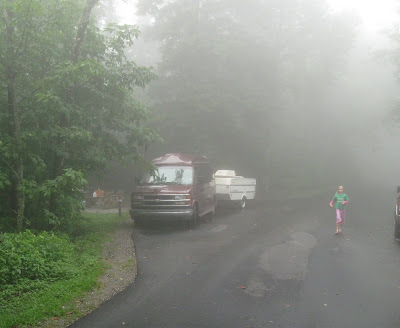 On Day 6 of our Smoky Mountain trip, we departed Elkmont Campground during early morning downpours interspersed with mild drizzles. 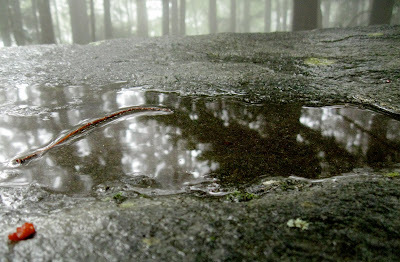 Moisture is a fact of life in the Smoky Mountains. Rain had been long overdue by the look of the streams in and around the campground and the park staff’s elation over the precipitation. Visiting in the Smokies with the expectation of continual sunny weather is unrealistic. #1. Breakfast and hot tea served to the sound of rain and the fresh smell of mountain vegetation. Husband Walter, intrepid putter-up and taker-down of our small pop-up camper, worked during spells of lighter rain to ready everything for our move to another campsite in the park. He then proceeded to prepare breakfast on our camp stove. We savored hot tea for me, coffee for him, and eggs and toast, all in the rain, under a blue tarpaulin that was only slightly leaky. #2. Happy, savvy campers. 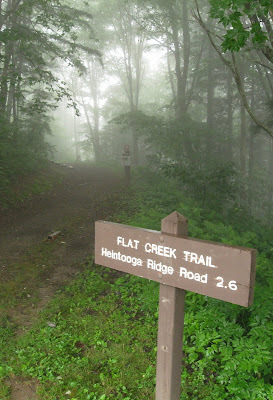 The rain had discouraged all but the determined and experienced from camping at our next destination at more than 5,000 feet on Balsam Mountain. Cool temperatures, occasional showers and eerie fog provided the perfect excuse to catch up on reading and napping. 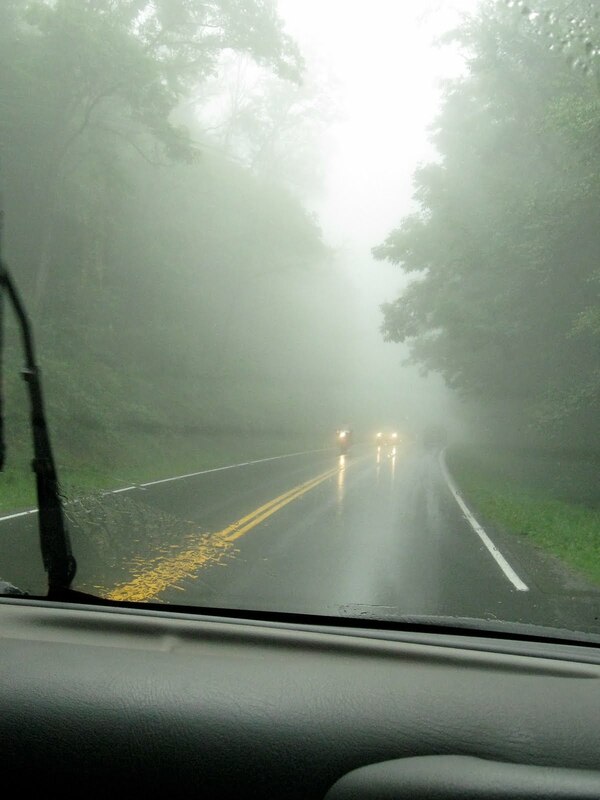 The only manmade sounds were laughter and conversation—made magical filtered through the dense fog. Van provides dry, snug cocoon. No hikers trudged the rain-soaked trails. . .
No picnickers gathered at the new tables near the front part of the picnic area. . . 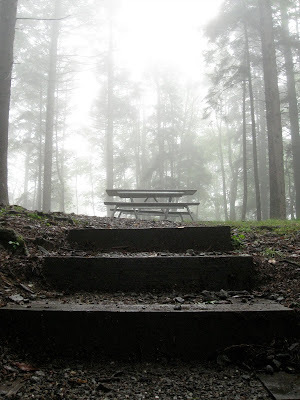 But best of all was the visit I always have to make to the remaining original granite picnic tables farther into the day-use area. 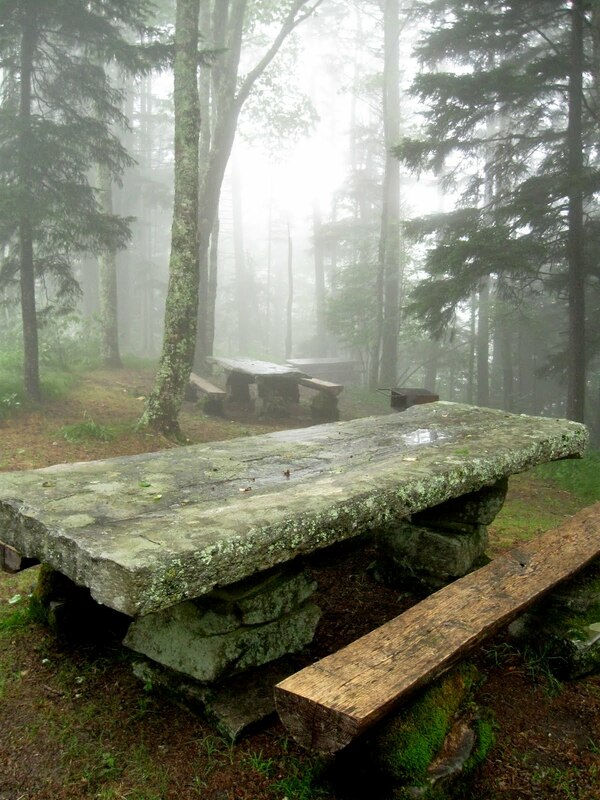 I am still trying to find out more about construction of the tables at this high-country site, but I think it is another example of work by the Civilian Conservation Corps after the park’s creation in 1934. In years past many of the massive granite tabletops were flat on the ground. Recently, however, several have been refurbished. They stand like friendly monuments to the young men of the “greatest generation” who executed construction and conservation in national parks prior to World War II. Pooled water on a granite tabletop reflects the misty forest. thanks for stopping by my blog yesterday. I came to see you and found these wonderful misty picnic table photos. i love shots like this, they are really good. @Sandra - Appreciate encouraging words!